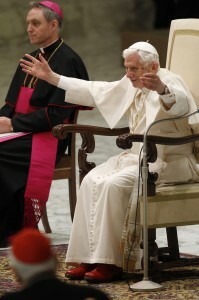 Pope Benedict XVI greets the crowd during his general audience in Paul VI hall at the Vatican Feb. 13. VATICAN CITY (CNS) — With the exception of a special farewell meeting with members of the College of Cardinals Feb. 28 and separate meetings with the prime minister and president of Italy, the Vatican confirmed Pope Benedict XVI’s original schedule for late February. Jesuit Father Federico Lombardi, Vatican spokesman, said that under the Code of Canon Law, no special formula or ceremony is needed to mark the end of a pontificate, and no special ceremony is planned before the pope leaves office Feb. 28. — A meeting Feb. 14 with priests of the Diocese of Rome. The meeting was moved to the Vatican audience hall because of number of priests expected to attend. — The pope will meet, as originally scheduled, with the president of Romania Feb. 15, with a group of bishops from Italy’s Liguria region who are making their visits “ad limina apostolorum,” and with members of a foundation that support papal projects. — On Feb. 16, Pope Benedict was scheduled to meet the president of Guatemala and a group of Italian bishops from the Lombardy region on “ad limina” visits. In view of his resignation and because of the papacy’s ties with Italy, the pope has added a private evening audience with Italian Prime Minister Mario Monti. — The pope will recite the Angelus at noon Feb. 17 as normal and, as previously scheduled, he will being his weeklong Lenten retreat with members of the Roman Curia that evening. — Pope Benedict has no public appointments, not even a general audience, Feb. 18-22 while on retreat. — Feb. 23, after the retreat concludes in the morning, the pope will meet with Italian President Giorgio Napolitano. — The pope will recite the Angelus Feb. 24 as normal. — He will have private meetings with “some cardinals from the Roman Curia” Feb. 25. — Pope Benedict will hold his final general audience Feb. 27; the gathering has been moved to St. Peter’s Square to accommodate the crowds that are expected. — On Feb. 28, the last full day of the pontificate, Pope Benedict will hold a special farewell meeting with members of the College of Cardinals. Father Lombardi said the gathering is an occasion for the pope to thank the cardinals, not any kind of ceremony. Around 5 p.m., the pope will fly by helicopter to Castel Gandolfo, where he will stay until remodeling is finished at the Mater Ecclesiae Monastery in the Vatican Gardens.